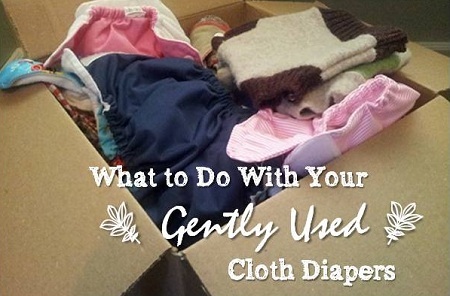 What do you do with gently used cloth diapers when they aren't needed anymore? Whether you plan to sell, donate or re-purpose them, read on for more information. This is a guest post. 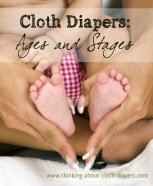 If you are interested in writing a guest post for Thinking About Cloth Diapers, please contact me! Thank-you! Offer your diapers in a “Free for Shipping” forum at places like Diaper Swappers. Simply post photos and brief descriptions and request that interested mothers message or email you with their zip code so you can figure the shipping cost. Post a photo and brief note on your Facebook wall and see if you get a response from your network of friends and family. There might be someone local to you, and that means no shipping would be necessary. At my church, mothers will sometimes bag items up, leave them in the parish hall and tack a note on that says “free” with a description of the contents. Donate/mail your used diapers to a charity that will distribute them on your behalf to a family in need. A few examples are Fluffy Wishes Diaper Closet, the Rebecca Foundation and Cloth for a Cause. You can find an extensive list of cloth diaper charities here. Diaper Pin, Diaper Swappers and Cloth Diaper Trader and three of the most popular places to buy and sell used diapers. Ebay and your local Craigslist are also good venues. Whichever you choose, good photos, accurate descriptions and competitive prices (figure in shipping) will help you make sales. You'll make the most money selling diapers on sites like this because your buyer will absorb the shipping cost. 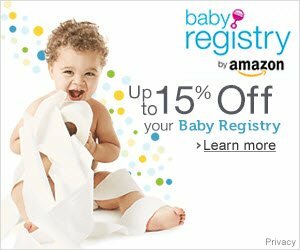 Sites like Re-Diaper buy used diapers and resell them on their sites. With services like this, you can usually opt for cash, consignment or store credit. Check with your favorite cloth diaper store. Some of them, like Cloth Diaper Outlet buy and sell new AND used diapers. And if you already like shopping there, the store credit will be valuable to you. The two main drawbacks to selling to a retailer or consigner are (1) you have to pay out of pocket to get the merchandise to them and (2) they are more particular about which brands they buy and the condition of the diapers. Turn them into burp cloths, wipes, dusting cloths or shop rags. Use old pockets for swim diapers. You don't want it to be absorbent, so leave out the insert. Let diapers find new life in your sewing projects. Some ideas: padding for pot holders, quilt pieces or squares, doll clothing or mama cloth. As you can see, cloth diapers will save you money in more ways than one over the long haul. And they might just be one of the most useful and hard-working items in your home! This is a guest post. Anne is the blogger behind Zephyr Hill Blog, which is one of my favorite cloth diaper resources! 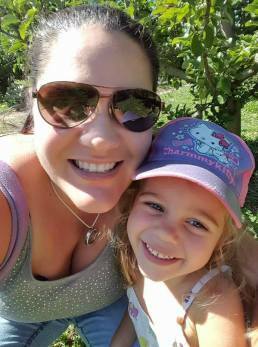 I encourage you to check out her blog, where she shares information about cloth diapers, family life, homeschooling, and life on the farm. Go back to Where to Buy Cloth Diapers.